You know how the Law of Attraction works. You get clear on what you want and what you don’t want. You ask. You allow. But you don't receive the things you'd love for the Law of Attraction to bring you. Love is what makes the Law of Attraction work. It brings the things you desire to you by making a pathway for them to enter into your life. Love helps you focus in a positive way on everything in your life now and everything you want to have. But What About the Things in Your Life that You Don't Want? Rather than looking at things and saying, “I hate that,” “I wish I had that,” “Why do they have that and I don’t?”…love forces you to open up and realize that there is something good in all things. The things in your life that you wish you could change – there’s a reason they’re there. While that reason may not always be clear, one thing always is – you created them. You may not know why or how you created them, but it happened nonetheless…so learn to love them. They’re yours. Fighting against the things you don't want will cause them to remain. Focusing on how much you wish they would change will only give them energy that will cause you to attract more of them into your life. No matter how much you might dislike them, how much they irk you, nor how they just make you want to scream from the top of your lungs for them to go away…there is something positive about them. Find that positive aspect and learn to love it. Even if the only positive thing you can find is that it gives you more clarity about what you actually do want, fill yourself with love for how wonderful that clarity is. Love will open a way for the things you dislike to leave your life and to allow you to attract what you truly desire. Remember to love what you desire as if you already have it right now. The more you love it, the more you can feel that good emotion, the faster your desire will manifest. 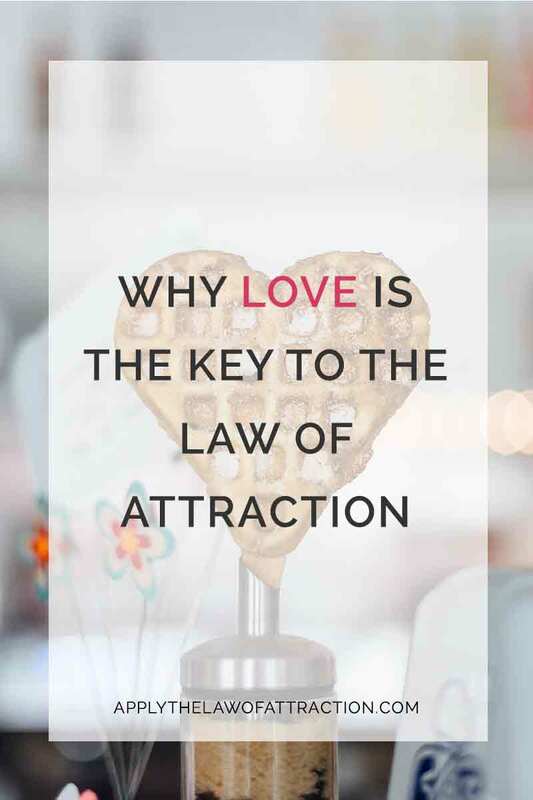 And, most importantly, the more often you feel the feeling of love regardless of the reason, the more you allow love to flow throughout your body, the faster the Law of Attraction will work. It can be as simple as silently repeating, “I love you,” throughout the day. Say it to yourself. Say it to everyone you come into contact. Say it to everything you do and see. Good things will begin happening to you. You won’t even have to ask for things to happen, they just will…unexpectedly. 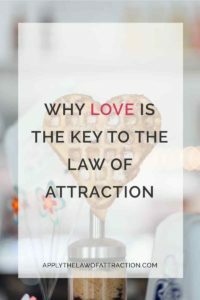 That's how powerful love is when it comes to the Law of Attraction. I love you I am sorry please forgive me THANK YOU!!!!??? I really love reading your posts Elizabeth. (I leave a comment on most of your posts). I bought your book on Love. And it really is too good. I stay with my mom because I’m broke. My dating life is also messy. Recently I went for an interview in my dream company(I thought so before!). I couldn’t clear it. I was really depressed but then I read this post & now I’m feeling really good & focused. I’m sure I’ll get a good job & the guy I’ve my eyes on! Wonderful Jessica! I see your desires manifesting immediately! as you said above that we need to give love to everything and everyone we come across right , but i want to know that , if we send love vibrations to someone can they feel it ? also does sending them love help in reducing negative feelings ? i want to send love vibration to my ex , so do you think he would get my vibrations ? Im really looking forward to get him back in my life but I heard he’s dating someone , so is it possible to have him back in my life ? Pls I need your help !! I really love your posts, thank you! You’re a wonderful LOA teacher! I have exams soon and I’m working really hard but for my mock exams I keep getting the same mark, will I be able to get a higher mark on my examination day? Hi Elizabeth, I was just wondering if you have ever heard of twin flames and your opinion on the subject matter? Do you believe in soul connections or past lives? Hello, I have recently started reading your posts about loa. Its been more than 5 years now that I’m aware about it but somehow i cant do it. Specially in terms of relationship. I’m in a long distance relationship for more almost 2 years now. Things have been rough but it’s coming to an end i can see.. the interest and feelings from his end has faded. Could you please guide me on how to better or improve this relationship. I cant find an answer anywhere. I remember seeing it in the book. I think when it talks about when deciding what you want for your ideal relationship with the person that if you want marriage include marriage in your list. I think you also add it to your script. Hi, I’ve been reading your posts and I absolutely love them! If I want to attract the love of my life, when I imagine, should I imagine the same scenario or make up more as if it is really happening everyday? Should I do this more than once in a day? Are there more good advices and tips you can give me to manifest my desires a lot easier? Thank you and have a great day! !